The album features 3 world premieres : "Romantic Passacaglia on a Twelve Tone Theme" by Margaret Meier, "Metropolitan Express", by Jeremiah Evans, and "Philadelphia Diary" by Curt Cacioppo. The Evans piece was written for and dedicated to Althea Waites, and the final work on the album, "Fantasy-Choruses on This Little Light of Mine" by Cacioppo, was also written for Ms.Waites. 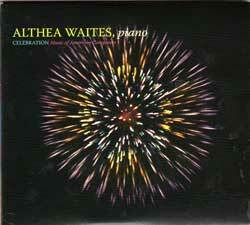 It is a stunning virtuoso piece with considerable musical and technical demands for the pianist. The concept for the album was to celebrate music which had not been recorded or rarely heard, and the ideal way to accomplish that was to do a recording and make it available to a broad listening audience. 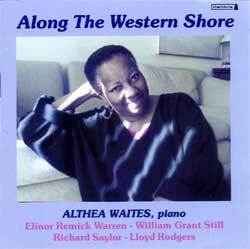 Cambria Master Recordings is honored to announce Along The Western Shore (CD-1141), a new compact disc featuring American pianist Althea Waites performing works by Elinor Remick Warren, William Grant Still, Richard Saylor, and Lloyd Rodgers. The West Coast has been a vital source of inspiration for composers, musicians, actors, writers and film-makers from every walk of life, and this album title, Along The Western Shore, reflects our intention to pay tribute to a group of composers who have either lived or worked in California at some point in their lives and who deserve wider recognition and exposure. Elinor Remick Warrren (1900-1991), best remembered for her art songs and choral-orchestral works, was a fine pianist in her own right and wrote several works for the instrument including the three magnificent pieces heard on this disc. William Grant Still (1895-1978), another American symphonic composer, lived in California from 1934 until his death. He wrote few works for the piano but his Seven Traceries, a lyrical suite fashioned after seven poems, is a work of abstractions bearing the imprint of mysticism. Richard Saylor’s Five Pieces for Piano are designed to highlight the tonal resources and color of the piano. Each piece has its own distinctive character and is based on a specific interval. Lloyd Rodgers Etcetera Variations (with pianist Mark Uranker), is based on the appended 14 canons to the Goldberg Variations, written by J.S. Bach as demonstrations of canon via species counterpoint. 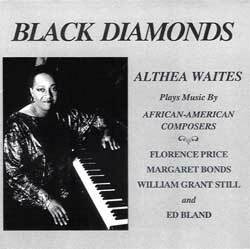 The landmark recording, “Black Diamonds", is an excellent collection of music by African-American composers who have not received broad exposure. Composers represented on the album include Florence Price, the first African-American woman to achieve national recognition, Margaret Bonds, protégë of Price, William Grant Still, acclaimed as the dean of African-American composers,and Ed Bland, whose music is highly original and cutting edge in terms of its sound and rhythmic innovation. Price’s 1932 Sonata in E Minor is the featured work on the recording,and uses lyrical folk themes coming from the African-American cultural tradition. Other works include Margaret Bonds’ “Troubled Water ‘- a striking virtuoso piece based on the spiritual,”Wade in the Water”, “Three Visions” by William Grant Still, and Ed Bland’s “Sketches:Set 7", played in its world premiere at New York’s Merkin Hall in 1987 by Ms.Waites. Ms. Waites has officially launched her record label, Kuumba Music for creative projects focusing on new music.